In his Friday Sermon of September 13, 2013 the Khalifatullah Hadhrat Munir Ahmad Azim Sahib (atba) of Mauritius, delivered from the Reunion Island, continued the theme of spiritual guidance in an age of material corruption and religious deviations. 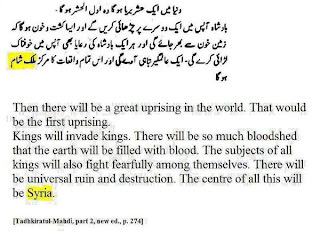 The establishment of the system of Divine Khilafat to safeguard the Sahih Al Islam in every age is directly linked to the blessings of Nubuwwat-e-Muhammadiyya. As the physical embodiment of such lofty blessings on the Ummah, it is incumbent upon all Muslims to recognize, accept and obey and help the Khalifatullah of their age. Instead of the administrative assemblies of the faithful seeking to control and regulate, define and delimit the freedoms and space of the Khalifatullah, it would be in their spiritual interest to await and follow the Divine instructions descending through him. “Corruption has appeared throughout the land and sea by what the hands of people have earned so He may let them taste part of (the consequence of) what they have done that perhaps they will return (to righteousness).” (30: 42). 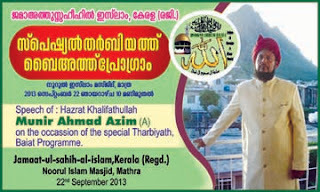 Recent Bai’at of some Ahmadis in Kerala, India at the hands of the Khalifatullah Hadhrat Munir Ahmad Azim Sahib (atba) of Mauritius has unsettled the mercenaries and officials of the Jamaat-e-Ahmadiyya. So much so that they used all channels possible and methods feasible to deviate these devout Muslims from their chosen path of recognizing and accepting the Imam of the Age! Family pressure, society pressure, money pressure and employment pressure-nothing could deter these courageous young men from following the path of Allah and moving away from the ‘comfort zone’ of all they knew as common Ahmadis coping with the trials and tribulations of everyday life. Those young men have patiently and bravely put up with all the mental torture, harassment, intimidation and satanic curses showered on them by people who call themselves ‘Ahmadis’. The egregious misconduct of the so-called mainstream is nothing but the satanic manifestations of the extent of their deviance and polar-drifting from the original teachings of the Promised Massih (as). As the Holy Qur'an indicates, it is indeed the youth who will begin to listen to a Divine Messenger when such a one arrives in a society where the Pharaohs and the great men will only seek to doubt and ridicule! For thoughtful Ahmadis, there is little doubt. Khalifatul Massih V Mirza Masroor Ahmad Sahib presides over the age of spiritual darkness and blatant idol-worship in Jamaat-e-Ahmadiyya. Unfortunately for him, the Khalifa does not enjoy the Divine converse despite the pretentions of office and the protestations of the faithful, nor could he produce any shred of evidence of being a recipient of Divine revelations in the last 10 years of his temporal “Khilafat”. 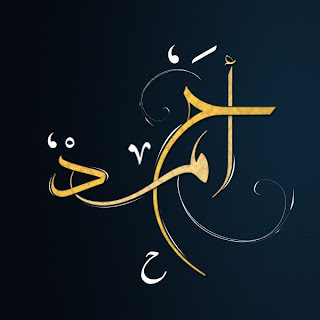 It is manifestly apparent and reasonably obvious that Allah (twa) has never appointed him to convey any Divine message to the world in His name and whatever he says and writes is purely what his inner self prompts him to do and everything he says is nothing but the product of his own mind and deliberation (if not that of his advisors)! In short, his ‘ideas’ are as good or as bad as any other human mind could conceive it. 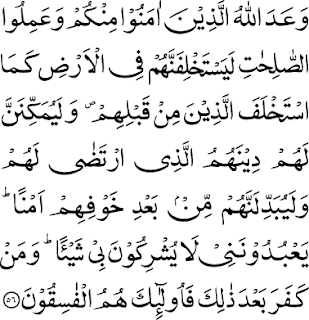 In an age in which Ahmadis have taken their Caliph as “the calf” (Idol), the ‘Samiri’ will suggest only what his mind conceive of (Holy Qur’an, 20:85-97), the Caliph cannot speak with the authority and conviction of an Elect of Allah, a Khalifatullah. 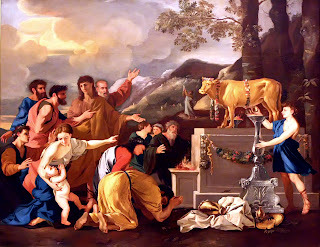 When the Prophet Moses (as) went for a few days to his Lord to do his obeisance and seek Divine blessings, the Samiris of the day digressed back the people into idol-worship. When Allah raises a Moses (Divine Elect) in a new age and that too, a century after the last Elect, he will warn the Samiris of the age. Taking serious note of the mind-games and psychological warfare by the Ahmadi leadership in India, in a special Speech on August 14, 2013, the Khalifatullah Hadhrat Munir Ahmad Azim Sahib (atba) of Mauritius commented upon the incidents against the larger backdrop of the terminal decline of spirituality among the Ahmadis of today. The extremely delicate situation in Syria, where the on-going civil war has consumed over 1,00,000 people and rendered millions into refugees and internally displaced persons, has created a mounting fear psychosis in the entire Middle East that a humongous war is in the offing, especially in the aftermath of the US declaration of intent at military intervention. While the regime of President Bashar Al Assad has come under a cloud of accusation of gassing its own people, the “humanitarian imperialists” who are proactive to ‘teach a lesson’ to the regime also face a credibility-deficit/crisis. As the US seek to use military force in Syria, its dreadful and despicable record of duplicitous dealings in matters of war and state terrorism in the past remind us of the devastating consequences the new war will entail for all people who are going to be caught up in it. A western war in Syria will only be putting a match to the tinterbox, engulfing the whole region and the wider Islamic world and beyond into a quagmire of unimaginable proportions. In the last decade of the Divine Manifestation, Allah (twa) has informed His Khalifa (the Khalifatullah) Hadhrat Munir Ahmad Azim Sahib (atba) of Mauritius several times about the internal and external threats the Muslim Ummah will face and taught him special prayers for the believers to recite in these troubled times. 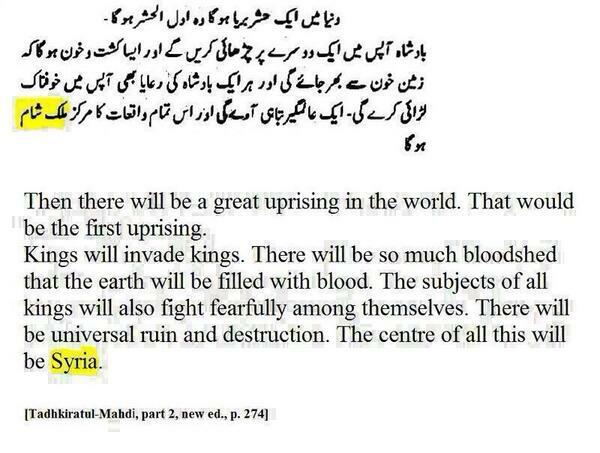 In a Speech on September 09, 2013 the Khalifatullah (atba) spoke on the escalating Syrian situation and the ominous signs of a World War staring at mankind, in the backdrop of the prophecies of the Promised Massih Hadhrat Ahmad (as). 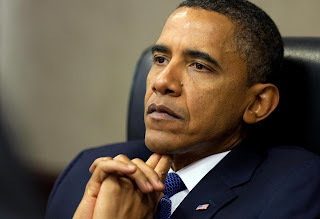 The US President, Barak H. Obama, is currently seeking domestic Congressional endorsement and international political support to legitimate his decision to invade Syria. The US war against Syria has the strategic support of Israel, which shares the goal of containing Iran and the Hizb-Allah of Lebanon, which are viewed as the last threat to Israel’s national security interests in the wider Middle East. As Iraq, Afghanistan, Libya and now Syria come under external attacks one after the other, the unfolding humanitarian disaster it represents for the common Muslim peoples is a matter of grave concern. The recent reports about the usage of chemical weapons in the on-going Syrian civil war provide the perfect pretext for the planned invasion. The unilateral intervention, without sufficient approval from the broader international community and the UN Security Council in particular, will be a naked violation of the rules and principles of international law. In the name of protecting the people, the US military intervention will only repeat the tragic history of destruction of the very edifice of yet another Muslim society. Whenever a Divine Messenger is raised in the world, it represents a spiritual test for all believers. To re-examine the validity of one’s father’s traditions and other inherited notions of belief systems requires a full commitment to be aware of the larger truth of the Divine reality. A matching humility of the heart to accept and follow the narrow and straight path of the Divine as one finds it is also necessary. Likewise, a courageous spirit to face the world with one’s innate conscience and the confidence of one’s convictions rooted in the sublime feeling of being mindful of Allah (twa) in all of one’s deeds constitute the identity of the new believer. Thus, to accept a Divine Reformer in a new era often means to put Allah (twa) and His judgement over all our ‘comfort zones’ of family and friends, relatives and brothers in faith. To be on the vanguard of creating a new world by following the Divine servant requires one to believe that Divine guidance is true guidance. 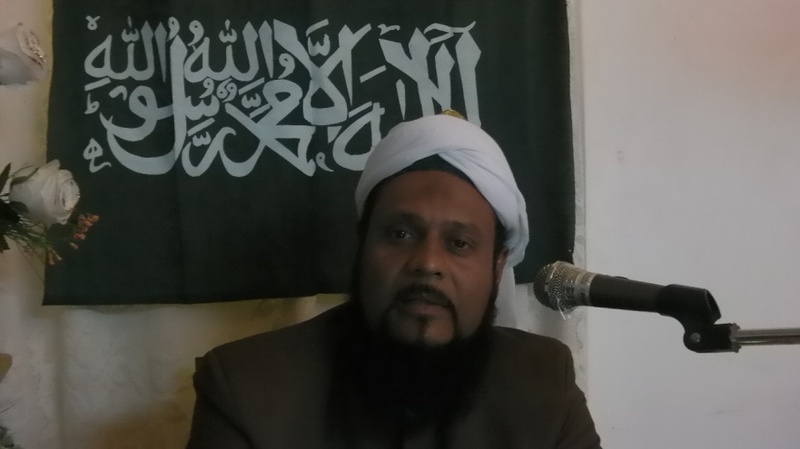 Muslims, including the Ahmadis, today face this challenge of spirituality as Allah (twa) has raised His Messenger in the personhood of the Khalifatullah Hadhrat Munir Ahmad Azim Sahib (atba) of Mauritius in the new century of Islam. It is for them to shun the arrogance of intellectualism and the hubris of special claims of Divine privileges and to adjust their spiritual doctrines and theological understandings to match step with the times of a Divine Messenger. 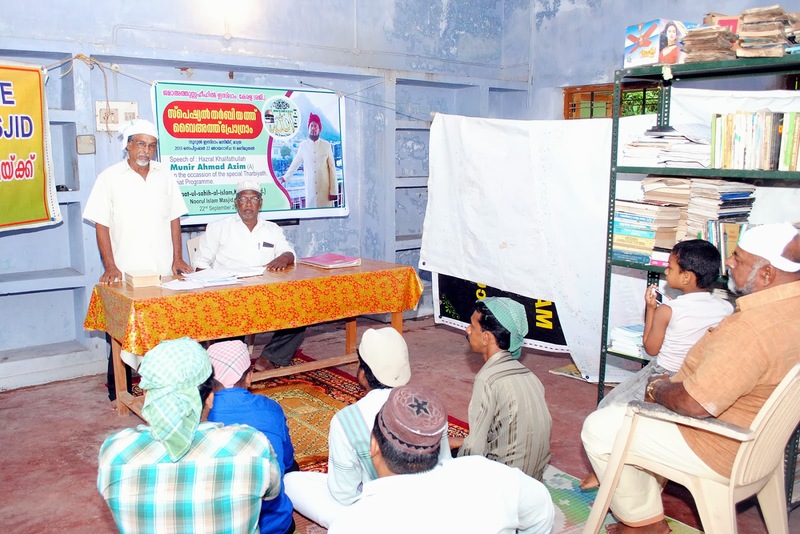 In August 2013, some members of the Ahmadiyya Muslim Community in Kerala followed their innermost spiritual convictions and accepted the new Mujaddid of the era, leaving aside their previous association with the man-elected Khilafat system in the Jamaat-e- Ahmadiyya. In a special Message issued on the occasion of the new Bai’ats on Saturday, August 10, 2013 the Khalifatullah (atba) reflects upon the empirical conditions in the Jamaat-e- Ahmadiyya that has necessitated the raising of a Divine Reformer as per Sunnat Allah (Divine practice) and also on the trials and rewards that await those who follow true Divine Guidance. 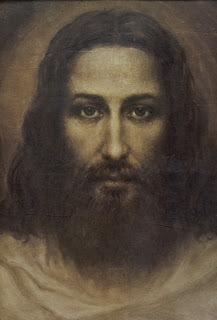 "He is the Knower of the unseen, and He does not grant anyone ascendancy over His domain of the unseen. 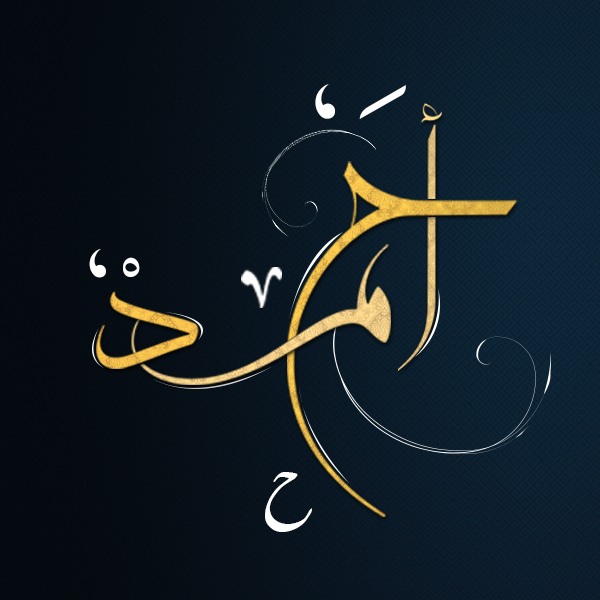 Except him whom He chooses as His Messenger." - The Holy Qur'an, 72: 27-28. The Khalifatullah Hadhrat Munir Ahmad Azim Sahib (atba) of Mauritius has received a spécial Divine Message in the French language (on Friday August 30, 2013 at 9.05 pm) containing intimations about the out-break of an epidemic in Maurice. [Inset: “The First War of the Balkans: Cholera Epidemic”-this colour engraving is from the cover of Le Petit Journal, published in Paris, December 1912. The graphic image of Death with his scythe communicates the news that a cholera epidemic has begun. The artist, who is unknown, depicts the flying figure of Death cutting down a river of humanity in a single stroke). The Divine révélation has come at a period of time when two airport employees died in the aftermath of leptospirosis, an infectious disease transmitted by rodents. It is a bacterial infection caused by leptospirosis. In most parts of the world, small mammals (rats, mice etc.) are presumed to be its wild reservoir. Their urine is almost always the direct or indirect source of human infections. In case of late diagnosis it causes kidney failure, which can result in death. Symptoms of leptospirosis: Its symptoms can be confused with flu or gastroenteritis as it is manifested by high fever, vomiting, severe headache, muscle aches, diarrhoea. And, to an advanced stage causing renal and hepatic problems. It is instructive to note that only recently, on August 15, 2013, the Khalifatullah (atba) spoke about the EVENTFUL year that 2013 has turned out to be in many, different ways: coups d’état, wars, political strategic plans against Muslim countries and consequently the continuous war between Muslim brothers. We can paint a whole picture of massacres in our today’s society. What is very important is that the humble servant of Allah has already warned the world about these events years ago and even at the end of 2012. 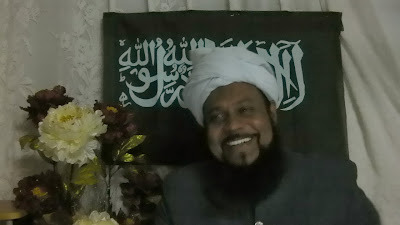 Hadhrat Khalifatullah (atba) has told very clearly that Mauritius and the neighbouring islands also will not be spared.